The public exhibition period for the draft Boroondara Community Plan has now ended. Your submissions are being reviewed and a final draft will be presented to Council for adoption on Monday 11 December 2017. 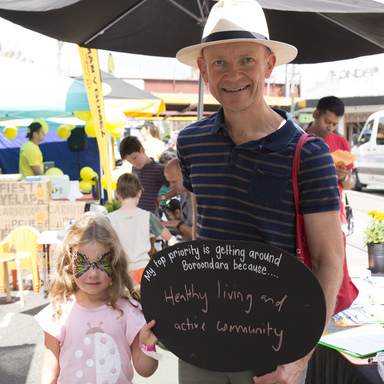 We are proud to present our draft Boroondara Community Plan for the next 10 years. Between November 2016 and April 2017, we undertook the largest program of community consultation that we have ever done. Our community shared their priorities and values, helping us to create a roadmap for the future of our vibrant City. This plan will be Council’s guiding strategic document and will meet the legislative requirements of a Municipal Public Health and Wellbeing Plan. The proposed plan will inform the Council Plan, budget processes and Council strategies, plans, policies and actions until 2027. Read the draft Boroondara Community Plan - PDF or draft Boroondara Community Plan - text format. To find out more about the community consultation that informed the draft Boroondara Community Plan, please see About the Boroondara Community Plan or contact the Community Planning and Development Department on 9278 4753 or email [email protected].